Community colleges -- sometimes called junior colleges, technical colleges or city colleges -- are mostly two-year public institutions of higher education, awarding certificates, diplomas and associate's degrees. Some community colleges offer technical credentials; many community colleges carry comprehensive transfer and career-oriented programs. Many community colleges offer adult and continuing education. The name community college originates from the fact the colleges primarily attract students from the local community and they are often supported by local taxes. According to the American Association of Community Colleges (AACC), the 1,132+ community colleges in the U.S. enroll nearly half of all undergraduates in the U.S.—just over 13 million students. These community colleges graduate 20-25 percent of all first-time, full-time students. For millions of adult learners and students, community colleges are vital pathways to more advanced education or enhanced employment. Earning an associate degree is a springboard to advancement for many, whether they transfer the credits to a four-year college or use it to procure a better job. An associate degree generally requires at least two but less than four years of full-time equivalent college work. Junior college graduates are well positioned with technical and workforce skills businesses are looking for while commanding top salaries. According to a 2009 study by The Miami Herald, community college graduates, on average, earn a higher starting salary than those who graduate from four-year institutions. Learning Outcomes: Values and practices that actively engage students and require them to stretch academically; explore learning freely; pursue a variety of educational experiences and areas of study. Cost-to-Value Outcomes: Reasonable tuition costs, access to financial aid resources and an emphasis on minimizing post-school debt. Looking for an online option? Visit The 50 Most Affordable Online Colleges for Associate Degrees. These top 50 community colleges measure up strongly on these five outcomes and more. Walla Walla Community College ranks #1 on The 50 Best Community Colleges in the United States! Walla Walla Community College (WWCC), a multi-campus community college, is located in southeastern Washington. Situated on 100 acres, the Walla Walla campus is an educational and cultural hub for the region. Walla Walla Community College's Clarkston Center, located in Clarkston, Washington, broadens its facilities and programs throughout a four-county district. Walla Walla Community college is a center of learning in Garfield and Asotin counties. WWCC also maintains a facility at the Washington State Penitentiary. With a current annual enrollment of over 13,000 new, returning and international students, Walla Walla Community College offers courses in Academic Transfer Education, Professional/Technical Education, Transitional Studies and Extended Learning. Generally speaking, academic courses (100 level or higher) at WWCC are transferable to most four-year institutions. WWCC's e-learning program enables students to get an Associate's degree entirely online or through a combination of on online and on-campus courses. The Running Start program offers high-school juniors and seniors an opportunity to enroll in courses at Walla Walla Community College. In addition to traditional areas of study, Walla Walla CC is a base for technical and local community learning, hosting the Ag Center of Excellence, educational opportunities in agriculture; College Cellars of Walla Walla, educational opportunities in the field of Enology and Viticulture, including an operating winery; Learning Center for Non Profits, resources, training and education to current and prospective staff and board members of nonprofits; Water and Environmental Center, education for environmental and economic sustainability; and the Walla Walla Valley Early Learning Coalition, helping to improve the lives of children and families through early childhood experiences. The Aspen Institute named Walla Walla Community College the 2013 co-winner of its prestigious Aspen Prize for Community College Excellence. The Aspen Institute also recognized the junior college as a 2011 Finalist with Distinction for the same prize. Santa Barbara City College ranks #2 on The 50 Best Community Colleges in the United States! The 104-year-old Santa Barbara City College (SBCC) is located in Santa Barbara, California, on a campus surrounded by stunning ocean views. The junior college serves the south coast of Santa Barbara County. The community college offers more than 50 certificate programs and 80 degrees, with an average class size of 28. SBCC has an enrollment of 20,000 students, of which 7,500+ are full-time. 57% of full-time students at SBCC transfer to four-year colleges; more than half of those ultimately earn a bachelor's degree. Agreements with 76 colleges (in and out of California) guarantee that SBCC credits are accepted for transfer; several schools ensure admission if a student meets academic requirements. The college's Transfer Achievement Program (TAP) helps students make informed decisions in their planning for the transition from SBCC to a four-year university. SBCC's Express-to-Success program uses small learning communities to assist students through first-year remedial courses to yield a significant rise in students' course completion. The college has a diverse student population and serves many traditionally underserved students, including an ever-increasing population of Hispanics. Hispanic students, who consist of 30+% of the student population, have achieved a notable three year-graduation/transfer rate of 48%. Aspen Institute named Santa Barbara City College the 2013 co-winner of its prestigious Aspen Prize for Community College Excellence. The Aspen Institute also recognized the college as a 2011 Finalist for the same prize. Santa Barbara City College ranked #23 in the CNN Money listing of community colleges in 2012. Lake Area Technical Institute ranks #3 on The 50 Best Community Colleges in the United States! Lake Area Technical Institute (LATI), a technical school located in Watertown, South Dakota, is the first technical school established in South Dakota. The campus serves an 18,000 square mile area. Lake Area Tech has 29 study programs and 11 E-degrees. The junior college serves more than 1,700 full-time, part-time and online students. The school boasts low tuition cost and a 99% graduate placement rate. A sampling of the school's programs: Agri-Business, Custom Paint & Fabrication Cosmetology, Robotics, Aviation Maintenance, and Nursing. Lake Area Technical Institute leads the nation in graduation rates and t helps its graduates secure jobs at strong salaries. 76 percent of first-time, full-time LATI students graduate or transfer to a four-year college within three years; the national average is 40 percent. LATI graduates recently averaged 40 percent in earnings than other new hires in the area. Through program-to-program articulation agreements, LATI graduates from a specific program may transfer LATI technical credits to a specific degree plan at South Dakota State University. Selected general education classes and technical credits may be used. Aspen Institute named Lake Area CC a 2013 Finalist with Distinction in its prestigious Aspen Prize for Community College Excellence. The Aspen Institute also recognized the college as a 2011 Finalist with Distinction for the same prize. The college ranked #11 in the CNN Money listing of community colleges in 2012. East San Gabriel Valley Regional Occupational Program & Technical Center ranks #4 on The 50 Best Community Colleges in the United States! East San Gabriel Valley ROP/TC, located in West Covina, California, is one of 72 regional occupational programs (ROPs) in the state of California. An ROP focuses on practical, hands-on career preparation and career guidance and is designed to provide high school and adult students with the technical skills required for specific jobs. Most of the classes offer community-based internships, in local business and industry sites. East San Gabriel Valley ROP/TC provides core majors of study such as: Business Management, Child development, Criminal Justice, Green Facilities Management, Health Science and Visual Communication. The Center partners with over 250 businesses and over 40 support service agencies to provide these unified educational experiences. These agreements allow students, who successfully completed selected courses, to enroll in training programs at the community college, without having to repeat previously covered materials. The community college ranked #1 in the CNN Money listing of community colleges in 2012. New Mexico Military Institute ranks #5 on The 50 Best Community Colleges in the United States! New Mexico Military Institute (NMMI), located in Roswell, New Mexico, is the only state-supported, co-educational, military boarding school in the United States. NMMI offers a college preparatory, four-year high school and a two-year junior college. One of only six military junior colleges in the U.S., New Mexico Military Institute's organization and architecture is based on Virginia Military Institute. The campus encompasses 40 acres of land, including an 18-hole golf course. Students at NMMI are referred to as “cadets” and the school averages 975 cadets, 95 percent of whom go on to four-year universities. At any time, cadets represent almost every state in the U.S. and a dozen foreign countries. The Corps of Cadets at New Mexico Military Institute has its own chain of command, responsible to the Commandant of Cadets and his staff. All cadets live under an honor system and are expected to meet the highest values of personal integrity. The honor code states that no cadet will “Lie, Cheat or Steal or Tolerate Those Who Do.” Cadets are required to defend and enforce the honor system. More than one-third of the college students are seeking an Army Commission. Annually, via a two-year Early Commissioning Program (ECP), the school commissions about 35 cadets as US Army 2nd Lieutenants. New Mexico Military Institute offers an all-inclusive liberal arts curriculum. An Associate in Arts degree requires sixty-eight hours of coursework. A cadet may choose to concentrate in a particular area while pursuing an Associate of Arts degree. The community college ranked #2 in the CNN Money listing of community colleges in 2012. North Central Kansas Technical College ranks #6 on The 50 Best Community Colleges in the United States! North Central Kansas Technical College (NCK Tech), a school of higher learning, offers degree, certificate and professional development education. NCK Tech's main campus is located in Beloit, Kansas; the branch campus is located in Hays, Kansas. North Central has an outstanding reputation for graduate placement, averaging over 90% annually. NCK Tech graduate salaries are consistently comparable to graduates of 2- and 4-year institutions. The junior college has also developed The Kansas Institute of Underground Technology, in partnership with the U.S. Department of Commerce and local businesses. The community college ranked #5 in the CNN Money listing of community colleges in 2012 and listed among the top 10% of all U.S. community colleges by the Aspen Institute in 2013. Valencia College ranks #7 on The 50 Best Community Colleges in the United States! Valencia College covers a broad region of mid-Florida, with campuses in east and west Orlando, Winter Park, Kissimmee, and Lake Nona. The college offers 30 Transfer Plans, 12 pre-major options and an Associate degree that guarantees admission to any Florida state university. The school offers more than 60 non-degree technical certificate programs. Valencia's continuing education program includes courses in career development, criminal justice, healthcare professions, language programs and professional development. The school had an enrollment of more than 70,000 students in 2012. Valencia College has a very diverse student population. Valencia ranks first among the U.S.'s two-year colleges for the total associate's degrees awarded. The school's graduation rate is triple the average of comparable two-year institutions in the U.S. Valencia ranks second in the number of degrees awarded to Hispanics and it's designated a “Hispanic Serving” institution with 27+ percent Hispanic students. The college ranks third in the number of associate degrees awarded to African Americans. Valencia graduates boast a job placement rate of 93%--95%. Director Steven Spielberg has called Valencia College's film program one of the best anywhere. The college's "Filmmaker in Residence" program invites talented producers, directors, writers and cinematographers to work with students on film projects. Valencia was the winner of the 2011 Aspen Prize for Community College Excellence and ranked as the No. 1 community college in the United States, according to Community College Week's 2011 listing of the top 100 schools. The college has an honors program and is a member of The National Collegiate Honors Council (NCHC). Snow College ranks #8 on The 50 Best Community Colleges in the United States! Snow College, a two-year state college, is located in rural Ephraim, Utah, about 120 miles south of Salt Lake City. Snow College is a part of the Utah System of Higher Education. Two campuses---the main campus in Ephraim and another campus in Richfield, Utah---serve a six-county area in Utah. Snow College boasts of having some of the lowest tuition rates of any accredited institution of higher education in Utah. Undergraduate enrollment averages 3000 yearly. The junior college also offers continuing education, online and honors classes. Snow College is widely regarded for its athletics, music and arts programs. The Horne School of Music, an all-Steinway School, is one of only 23 2-year colleges accredited by the National Association of Schools of Music in the U.S. Snow College music graduates have played in some of the finest colleges and musical groups in the world. Snow College hosts some of the finest U.S. music camps, such as the Juilliard Jazz Summer Workshop and the Manhattan to the Mountains Chamber Workshop. The National Association of Schools of Theatre has awarded Snow's theatre arts department full accreditation and membership, an honor only bestowed to three other 2-year colleges. Snow College's athletic teams, known as Badgers, are consistently highly ranked regionally and nationally. The college's art program is highly recommended and is known to other colleges throughout the US. Some of its students have gone on to colleges including Cornwall, University of Utah, New York Art Academy and other institutions. The Ephraim campus is home to the Eccles Center for the Performing Arts (concert hall and theatre), Activity Center and art gallery; the Richfield campus houses the Sevier Valley Center, an indoor arena and theater. The surrounding community uses the facilities on both campuses. Snow College is a member of the National Collegiate Honors Council (NCHC). Snow College ranked #6 in the CNN Money listing of community colleges in 2012 and listed among the top 10% U.S. community colleges by the Aspen Institute in 2013. Saint Paul College ranks #9 on The 50 Best Community Colleges in the United States! Saint Paul College a community and technical college, established in 1910 is located in St. Paul, Minnesota. The school has about 10,000 full-time and part-time students. Saint Paul College offers traditional classes, online classes and hybrid classes. The college provides 39 associate degree programs as well as 60 career certificate and diploma programs. Saint Paul College focuses on advanced technology to enhance the curriculum and the learning experience. The school also provides students free tutoring. The Power of YOU scholarship programs provide free tuition to qualified students who graduate from St. Paul or Minneapolis public schools. Student Life provides an array of social, wellness, educational and cultural events. Saint Paul College has transfer agreements with four-year colleges and universities to provide pathways for students to transfer to continue their higher education. Saint Paul College ranked the #1 community college in the 2010 Washington Monthly ranking of America's best community colleges. Mayland Community College ranks #10 on The 50 Best Community Colleges in the United States! Mayland Community College, located in Spruce Pine, North Carolina, also operates the Avery Learning Center in Newland, North Carolina and the Yancey Learning Center in Burnsville, North Carolina. Mayland Community College is part of the North Carolina Community College System. The college has partnerships with area colleges and universities to provide transfer options to students. The school offers 35 programs. The junior college offers an Associate in Arts, an Associate in Fine Arts and an Associate in Science degree. Besides providing classes for college credit, Mayland Community College provides classes for enrichment, skills development and personal enjoyment. Mayland Community College ranked the #4 community college in the 2010 Washington Monthly ranking of America's best community colleges. Northwest Iowa Community College ranks #11 on The 50 Best Community Colleges in the United States! Northwest Iowa Community College (NWICC), an institution of higher learning, is situated on a large campus in the rural town of Sheldon, Iowa. For local residents, the Northwest Iowa Lifelong Learning and Recreation Center is a state-of-the-art recreational facility which includes an indoor walking/running track, fitness classes, yoga, Pilates, indoor cycling, training with certified personal trainers, and much more. NWICC's student placement rate averages 98% and its skilled specialist programs have consistently had 100% employment success for its graduates. The junior college has transfer agreements with universities throughout the Midwest, including South Dakota State University, University of Iowa, and Iowa State University. Enrollment in credit programs is approximately 2,000 annually; non-credit enrollment exceeds 28,000 for students of high school completion, continuing education, online education and skill training services for area businesses. The NWICC College for High School Students offers a chance for some to complete their high school diploma and begin career training or college-level study. The NW Iowa Development Network is comprised of local and regional businesses and partners with NWICC and the Iowa Department of Economic Development (IDED) to address the rapid growth in the rural sector of NW Iowa. Northwest Iowa Community College ranked #7 in the CNN Money listing of community colleges in 2012 and The Aspen Institute listed NW Iowa Community College among the top 10% of U.S. community colleges in 2013. Southeast Community College Lincoln ranks #12 on The 50 Best Community Colleges in the United States! Southeast Community College Lincoln (SCC-Lincoln), a community college network, is located in the southeast portion of Nebraska. It has three campuses and more than 20 learning centers in a 15-county district. The annual enrollment of full-time and part-time commuter students across the various campuses is ~11,000. SCC-Lincoln provides over 50 programs of study; it also offers 12 online study programs and more than 300 courses each term. The college awards the Associate of Applied Science Degree, Associate of Arts Degree, Associate of Science Degree, Diploma, and Certificate. The Nebraska Transfer Initiative, a cooperative effort among Nebraska's higher education institutions, provides a seamless transition for SCC-Lincoln graduates to four-year schools. For eight consecutive years SCC-Lincoln has produced the most graduates in Precision Production fields (Computer Aided Design Drafting, Machine Tool Technology, Manufacturing Engineering Technology) than any other school in the U.S.
SCC-Lincoln offers workshops, classes and seminars to people of all ages in its Continuing Education Program. The junior college also hosts a nationally-renown Entrepreneurship Center which operates a business incubator for new and growing enterprises. The community college has a special focus on global education, aiming to infuse global perspectives into all courses to better prepare students for an increasingly global workplace. Southeast Community College Lincoln ranked #8 in the CNN Money listing of community colleges in 2012 and listed among the top 120 U.S. community colleges by the Aspen Institute in 2011 and 2013. The community college ranked #8 among a list of 786 community colleges in the U.S. for Student Success Rates, based on graduation and retention stats. Victor Valley College ranks #13 on The 50 Best Community Colleges in the United States! Victor Valley Community College, located in Victorville, California, offers associate degrees in an array of areas. The community college offers majors such as business management, registered nursing, music, welding, agriculture and natural resources, animation, criminal justice and construction technology. The college offers traditional classes and some online classes. Victor Valley Community College, one of the largest community colleges in California, has about 12,000 full-time students. Victor Valley College's Health Science/Public Safety/Industrial Technology division provides career technical education. The Science, Technology, Engineering, and Math (S.T.E.M.) division prepares students to transfer to four-year colleges and universities and prepares them for careers requiring a math or science background. Victor Valley Community College provides vocational technology labs in agriculture, engineering, construction, welding and in other fields. The Center for institutional Excellence provides guidance and support for all the school's academic and non-academic programs on campus. The center evaluates change and offers best educational practices via evaluations and program reviews. Victor Valley College ranked #3 in the CNN Money listing of top community colleges in 2012. Georgia Military College ranks #14 on The 50 Best Community Colleges in the United States! Georgia Military College, established in 1879 and located in Milledgeville, Georgia, is a co-educational liberal arts junior college and a separate preparatory school (grades 6-12). GMC focuses its educational programs on two facets: 1) Development of the intellect and 2) Elevation of character and three values: Duty, Honor and Country. The main campus in Milledgeville serves approximately 275 full-time, resident ROTC students (the Corps of Cadets) and 200-300 commuting students. GMC's 5 distance learning centers and 2 extension offices in Atlanta, Augusta, Columbus, Madison, Sandersville, Valdosta and Warner Robins serve ~4,000 students. The distance learning centers also serve as junior colleges to their local communities. The preparatory school's ACCEL Program enables qualified seniors to attend classes at the junior college and the high school simultaneously, while earning credit for both their high school diploma and their college degree. GMC is one of five military junior colleges in the Army's Early Commissioning Program (ECP). Cadets who graduate from the college's two-year, military science-oriented curriculum receive an officer's commission in the U.S. Army. After completing the two-year degree, GMC graduates pursuing a 4-year degree at Georgia's senior military college, North Georgia College and State University (NGC&SU) in Dahlonega, Georgia qualify for a transfer scholarship. After completing their four-year degrees, they are promoted as a 1st Lieutenant in the US Army. In addition, numerous articulation agreements exist between allied colleges. The college offers 3 degrees: Associate of Arts (AA), Associate of Science (AS) and Associate of Applied Science (AAS) in a variety of study areas, e.g. Criminal Justice, Human Communication, Logistics Management, International Affairs, Psychology. GMC's classes are small, typically no more than 15 students, and ensuring individual attention; for students who request it. Every course provides free tutoring. College Atlas.org named MMI one of the top 25 community colleges. The college ranked #9 in the CNN Money listing of community colleges in 2012. GMC ranked #12 in the 2010 Washington Monthly ranking of top 100 U.S. community colleges. DeAnza College ranks #15 on The 50 Best Community Colleges in the United States! DeAnza College, located in Cupertino, California, also home to Apple, Symantec, Sun, Hewlett-Packard, and many other high-technology firms. The community college is part of Silicon Valley's Foothill-De Anza Community College District, which also administers Foothill College in Los Altos Hills, California. The district serves the cities of Cupertino, Los Altos, Los Altos Hills, Mountain View, Palo Alto, Sunnyvale and San Jose. The annual enrollment is ~22,000 students, with a transfer rate of ~1,800 students. DeAnza College has 10 instructional divisions which sustain more than 100 areas of study. The college offers 90-plus associate degree and university transfer programs, including popular majors such as Animation, Broadcasting, Biological, Health and Environmental Sciences, Graphic Design and Computer Graphics. The college's Intercultural/International Studies program has garnered much attention and the college attracts students from more than 50 countries. The Community Education program offers non-credit classes, weekend adult workshops and summer programs for children. DeAnza College is a cultural hub for the Silicon Valley area. It is the home of Flint Center for the Performing, the Fujitsu Planetarium, the Euphrat Museum of Art and the California History Center. The Kirsch Center, which opened in 2005, is a carbon-easy, sustainability-leading building and was the first community college building in the US to receive a LEED platinum rating. It's a favored location for Silicon Valley conferences and events. DeAnza College consistently ranks #1 or #2 in the state annually for the number of students who transfer to the University of California and California State University campuses. The college ranked #10 in the CNN Money listing of top community colleges in 2012. DeAnza ranked #45 in the 2010 Washington Monthly ranking of the top 100 U.S. community colleges. Marion Military Institute ranks #16 on The 50 Best Community Colleges in the United States! Marion Military Institute (MMI), located in Marion, Alabama, is a two-year junior college and regarded as the official state military college of Alabama. Founded in 1842, MMI is the oldest military junior college in the U.S. The junior college focuses on intellectual, moral-ethical, physical-athletic, and leadership development experiences in a military environment. In recent years, MMI has produced more than 206 admirals and generals; the school has a number of renowned military alumni. MMI offers various military training programs including the Army's Early Commissioning Program (ECP) in which qualified students can get commissioned as a Second Lieutenant after two years of college. The Service Academy Preparation Program (SAP) provides freshmen a year of solid academic and physical preparation for students who wish to attend one of the Service Academies (West Point, Air Force Academy, Naval Academy, Merchant Marine Academy or Coast Guard Academy). Marion also offers the first two years of the Air Force Reserve Officer Training Corps. MMI recently introduced a new program: An extracurricular flight-training program using a local partner in aviation. Enrollees learn to fly through a combination of online ground school instruction, computer-based and in-flight training. Providing a private pilot's certificate, the program is designed to preclude U.S. Air Force and Navy Initial Flight Screening (IFS) requirements. Annual enrollment of degree- and non-degree-seeking students is ~400. The junior college offers Associate of Science and Associate of Arts degree programs, based on a rigorous General Studies curriculum. Within these programs, students may select study options based on their interests; they can choose the General Studies curriculum or, focus on specific disciplines e.g. Natural Science, Pre-nursing, Elementary Education or Criminal Justice. Cadet life at Marion is rich with extracurricular options such as Choir, Sports, Drama, Band, Drill Team, etc. The college ranked #12 in the CNN Money list of top community colleges in 2012. Kingsborough Community College ranks #17 on The 50 Best Community Colleges in the United States! Kingsborough Community College, located in Brooklyn, New York, is part of The City University of New York (CUNY) system. Kingsborough Community College provides a broad range of associate degree programs in the liberal arts and in career education. The community college also provides certificate programs in an array of areas. Kingsborough Community College offers programs for special populations including the My Turn program which provides free tuition for residents 60 years of age and older. College Now prepares high school students for college-level work. New Start provides a second chance to students who had difficulty in college. Most of the classes have less than 30 students, allowing instructors to teach students via hands-on learning and group discussions utilizing technology such as video-conferencing rooms and smart classrooms. Kingsborough Community College named one of the nation's top community colleges by the New York Times. The community college named a 2013 Aspen Institute Finalist with Distinction. Community College Week reports Kingsborough Community College consistently ranks in the upper half of the top 100 community colleges in the nation awarding associate degrees to minorities as well as the number of associate degrees awarded in total. Kingsborough Community College received an award from the national community college honor society, Phi Theta Kappa, for the chapter with the largest growth. Western Wyoming Community College ranks #18 on The 50 Best Community Colleges in the United States! Situated in Rock Springs, Wyoming, Western Wyoming Community College (WWCC) is one of seven community colleges in Wyoming. An extended campus center is located in Green River in Sweetwater County. Rock Springs is the fourth largest town in Wyoming; the next closest towns are Salt Lake City, Utah (180 miles) and Denver, Colorado (350 miles). Yellowstone National Park, Grand Teton National Park and Flaming Gorge National Recreation Area are all accessible to the WCCCC community. Due to the high elevation and harsh winters in the area, all of the main college is located indoors, connected by hallways. Western Wyoming Community College confers Associate of Arts (AA), Associate of Fine Arts (AFA), Associate of Nursing (AN), Associate of Science (AS) and Associate of Applied Science (AAS) degrees, and a few four-year degrees in partnership with the University of Wyoming in Laramie, Wyoming. Close to 70 percent of students are in transfer programs. The school has a strong international students segment, with many resources including a host family program. Online and compressed video courses are available statewide; online courses may be taken for associate, bachelor and master degree courses. An annual “Wyoming Safety & Workforce Summit” is free to the community and offers presentations on safety issues and workforce development. WWCC is also home to the Instructional Well-Site Facility, a closed-loop system that provides “real world” training for local industry technicians and customized specialty courses. This site also serves as a meeting space for industry professionals. WWCC is a member of The National Collegiate Honors Council (NCHC). College Atlas.org named WWCC one of the top 25 community colleges. The college ranked #13 in the CNN Money listing of top community colleges in 2012. Finally, WCCC ranked #15 in the 2010 Washington Monthly ranking of the top 100 U. S. community colleges. North Iowa Area Community College ranks #19 on The 50 Best Community Colleges in the United States! North Iowa Area Community College (NIACC), a two-year community college located in Mason City, Iowa, serves the North Iowa region. North Iowa Area Community College was founded in 1918 as the first public two-year college in Iowa. Annual enrollment at North Iowa is 3700, with 56% enrolled in transfer programs and 44% in Career/Vocational programs. Among first-time, full-time degree-seeking students at NIACC, 42% graduate within 3 years and another 20% transfer prior to graduation. NIACC has more than 40 articulation agreements with 4-year colleges and universities and almost all of the school's career/vocational programs are transferable. The community college has a notably low tuition, compared to other community colleges, colleges and universities in the region. Additionally, NIACC offers an “Extreme Makeover: College Edition” contest annually, where two lucky students win an entire year of education at NIACC for free, including textbooks and other resources. NIACC Career & Technical graduates have a 95% placement rate while 91% of NIACC graduates continue to live and work in North Iowa. NIACC's John Pappajohn Entrepreneurial Center is a major source of entrepreneurial support for local residents and the community in reaching their potential. The center has assisted in 127 new local business starts and 300+ new statewide starts. The junior college has a strong intercollegiate athletics program – with more than 250 students involved -- including men's baseball, basketball, wrestling, golf, cross country, soccer and track & field; and women's basketball, softball, cross country, volleyball, golf and track & field. For example, NIACC claimed the 2013 Region XI baseball title. The NIACC Performing Arts & Leadership Series offers a variety of shows, entertaining ~16,000 people each year. Online classes and a continuing education program provide learning to more than 3000 participants annually. The Aspen Institute listed North Iowa Area Community College among the top 10% of all U.S. community colleges in 2013. The college ranked #14 in the CNN Money listing of top community colleges in 2012. Northeast Alabama Community College ranks #20 on The 50 Best Community Colleges in the United States! Situated near Rainsville, Alabama between DeKalb and Jackson counties, Northeast Alabama Community College (NACC) serves the Northeast Alabama region. Through the academic divisions at Northeast Alabama Community College – Business & Computer Science, English & Fine Arts, Mathematics, Health Sciences, Social Science/Speech/Foreign Language and Natural Sciences -- students may earn an Associate of Arts (AA), Associate in Science (AS) or Associate of Applied Science (AAS) degree in more than 130 majors. Career/Technical programs, which lead to a certificate or an Associate of Applied Science (AAS) degree, include such programs as Drafting & Design Technology, Salon & Spa Management, Industrial Electronics, and Emergency Medical Services. STARS (for state colleges and universities in Alabama) and 2TO4 (for independent colleges and universities in Alabama) are articulation agreements guaranteeing NACC credits transfer to four-year institutions and two years at NACC counts as two years towards a bachelor degree. Graduates of its Technical/Career programs have ranked first within the Alabama Community College System in job retention and NACC students have placed first among prospective teachers taking the Basic Skills test. Northeast Alabama Community College also has Distance Education, Continuing Education (including ESL and GED) and Workplace Education (classes offered by a company or industry specifically for its employees) programs available. Additionally, NACC chosen as one of 36 colleges to participate in the Plus 50 Encore Completion Program, a national effort sponsored by the American Association of Community Colleges (AACC) to train 10,000 baby boomers for new jobs in healthcare, education and social services. The community college ranked #15 in the CNN Money listing of top community colleges in 2012. The Aspen Institute listed Northeast Alabama Community College among the top 10% of all U.S. community colleges in 2013. Colorado Mountain College ranks #21 on The 50 Best Community Colleges in the United States! Colorado Mountain College (CMC) is a network of eleven community college campuses that serves nine counties in north-central Colorado: Chaffee, Eagle, Garfield, Grand, Jackson, Lake, Pitkin, Routt and Summit. The average annual enrollment across all campuses is 24,000, with 3600 full-time students. The junior college grants associates degrees and four-year bachelor degrees in Business Administration and Sustainability Studies. Top degree programs are Business, Nursing, EMT, Outdoor Education and transfer programs. Graduates of many of CMC's courses are employed in Colorado's winter and summer tourism-oriented economies. The Colorado Mountain College Ski Team at the Steamboat Springs campus is a member of the Rocky Mountain Intercollegiate Ski Association, the strongest college ski racing conference in the U.S. In 2012, the Isaacson School for New Media, one of the country's first community college programs dedicated to new media, opened at CMC. With classes offered at the Aspen, Colorado, Spring Valley and Glenwood Springs campuses, the school offers courses in digital journalism, digital media, digital marketing and design. The school provides professional training, certificates and degrees. In another arena, students can earn an Associate of Applied Science (AAS) degree in Professional Photography at the Spring Valley campus. Faculty in the Photography program includes shared Pulitzer Prize winner Steven G. Smith. CMC's Workforce Training and Customized Business Services offers professional development courses e.g. supervisory skills, safety, workplace Spanish, social media. Colorado Mountain College ranked #17 in the CNN Money listing of top community colleges in 2012. CollegeMeasures.org ranks CMC #17 in the nation for graduation plus transfer rates for schools with more than 200 full-time freshmen. The college is also ranked #1 among Colorado's two-year colleges for graduation plus transfer rates. Mitchell Technical Institute ranks #22 on The 50 Best Community Colleges in the United States! Located in Mitchell, South Dakota, Mitchell Technical Institute (MTI) is a post-high-school vocational technical school. MTI operates two campus locations. Annual enrollment at MTI averages 1,000 students, with notable diversity. The school is military friendly and more than 89% of MTI students receive financial aid. MTI is respected for its strong job placement rate -- 96% among its graduates. MTI also strives to meet local business and community needs through adult, business and industrial training programs, including programs that require licensure or recertification. For example, the school has partnered with the satellite communications provider, GVF, to offer professional satellite communications courses for VSAT training. Successful completion of the courses paired with the Hands-on-Skills Testing can lead to the GVF Basic VSAT Installer Certification or the GVF Advanced VSAT Installer Certification. The Oak Room, an elegant dining room staffed by MTI students, is an integral part of the Culinary Academy at Mitchell Technical Institute. It serves meals five days a week, September through April. Examples of its degree programs include Power Sports Technology, Wind Turbine Technology, Satellite Communications and Speech-Language Pathology Assistant. The Aspen Institute listed Mitchell Technical Institute among the top 10% of U.S. community colleges in 2011 and 2013. The community college ranked #16 in the CNN Money listing of top community colleges in 2012. Itasca Community College ranks #23 on The 50 Best Community Colleges in the United States! Itasca Community College, established in 1922 is located in Grand Rapids, Minnesota. The community college has about 1,900 students. The college offers Associate in Arts degree, an Associate in Science Degree, an Associate in Applied Science degree, diplomas and professional certificates. Besides traditional programs Itasca Community College provides several programs entirely online and an array of programs which include on-campus and online courses. The school offers an. Students can complete the first two years of a bachelor's degree in just about any field. Itasca Community College provides free tutoring and provides a special needs office, an academic resource center and computer labs. The school has on-campus student housing in Wenger and Itasca Halls. Itasca Community College ranked the #5 community college in the 2010 Washington Monthly ranking of America's best community colleges and #30 in the CNN Money listing of community colleges in 2012. Alexandria Technical & Community College ranks #24 on The 50 Best Community Colleges in the United States! Located in Alexandria, Minnesota, a rural community, Alexandria Technical & Community College (ATCC) is a two-year college and a member of the Minnesota State Colleges and Universities (MnSCU) system. The school offers more than 50 study programs, ranging from certificates to Associate of Science (AS), Associate of Applied Science (AAS) and Associate of Arts (AA) degrees. Alexandria T&C is one of the few colleges in Minnesota that offers a law enforcement program, making it one of ATCC's most popular programs; students in the law enforcement program may earn an AAS degree, an AS transfer degree and a career transition degree. Alexandria Technical & Community College serves 2200 students annually, in studies from Farm/Ranch Management to Web/Multimedia Design, Nursing to Hospitality Administration and Fashion Management to Computer & Voice Networking. The school provides assistance for students with disabilities, tutoring services and writing assistance. Alexandria Technical & Community College has the highest graduation rate for two-year public colleges in the state of Minnesota as well as a high job placement rate of over 90%. With Alexandria's Post Secondary Enrollment Options (PSEO), high school students are able to enroll full-time or part-time in college courses or programs. PSEO students receive free tuition and course required textbooks at no cost. College Atlas.org named CVTC one of the top 25 community colleges in 2012. The college ranked #27 in the CNN Money listing of top community colleges in 2012. The Aspen Institute listed Alexandria among the top 10% of U.S. community colleges in 2013. Alexandria ranked #8 in the 2010 Washington Monthly ranking of the top 100 U. S. community colleges. West Kentucky Community & Technical College ranks #25 on The 50 Best Community Colleges in the United States! West Kentucky Community & Technical College, located in Paducah, Kentucky, is one of the sixteen open admissions, two-year colleges within the Kentucky Community and Technical College System (KCTCS). The school serves 10 counties in the Purchase and surrounding area. WKCTC offers three two-year degrees – Associate in Arts, Associate in Fine Arts in Visual Arts, and Associate in Science – all with a general education core and additional courses designed to parallel the first two years of a bachelor's degree. The school provides a broad array of instructional programs ranging from Fire/Rescue Science and Homeland Security/Emergency Management Technology to Culinary Arts and Respiratory Care. West Kentucky's Workforce Solutions offers specialized training for local businesses and professionals. The online training program includes classes in Residential Construction. For residents of every age its Community Education department offers a variety of programs including Zumba, Lego Summer Camp, Science Camp, Cooking, Estate Planning, Senior Learning, etc. The community college houses the Clemens Fine Arts Center which presents a diverse itinerary of performance and visual arts opportunities, including professional touring productions of plays and musicals, dance companies, celebrity recording artists, speaker series and art exhibits, as well as performances by students and local residents. WKCTC provides a variety of extracurricular activities including career clubs, professional fraternities and faith/ethnic/cultural organizations. Aspen Institute named West Kentucky C&T College a 2013 Finalist in its prestigious Aspen Prize for Community College Excellence. The Aspen Institute also recognized the college as a 2011 Finalist with Distinction for the same prize. Rend Lake College ranks #26 on The 50 Best Community Colleges in the United States! Rend Lake College (RLC), located in Ina, Illinois, on the eastern shore of Rend Lake, has two satellite campuses: Rend Lake College MarketPlace in Mt. Vernon and the Rend Lake College Murphy-Wall Pinckneyville Campus. A few examples of degree-programs are Surveying Technology (AAS), Wireless Communications Technology (AAS), Architectural Technology (AAS) and Early Childhood Education (AAS). Annual enrollment at RLC averages 5000 for full-time, degree-focused students, 4000 part-time students and 4000 non-credit enrollees. Rend Lake College had been characterized as serving a relatively homogenous rural, small town culture. However, ethnic diversity has expanded at the school, as the college has broadened its study programs and with greater mobility across the country. The campus has notable facilities: The Jimmy J. Fulks Aquatics Center includes a six-lane, 75'x45' pool with a ramp for the physically challenged, a therapy pool and a whirlpool. In addition to classes, the pool is available for recreational use and public memberships. The Applied Science Center is a 22,300 sq. ft. facility that houses a number of programs, including Agricultural Business, Agricultural Production, Agricultural Mechanics, Heavy Equipment and Diesel Technology. The RLC Children's Center serves the child care needs of students and staff, as well as the educational laboratory needs of the college's Early Childhood Education program. The school's Learning Enhancement Center and its SMARTHINKING Online Tutoring Program are resources available to all RLC students. The Student Transfer And Retention Support (STARS) Program was created to assist RLC students successfully complete a college degree and transfer to a four-year university. The college ranked #18 in the CNN Money listing of top community colleges in 2012. The Aspen Institute listed Rend Lake among the top 10% of U.S. community colleges in 2013. Ellsworth Community College ranks #27 on The 50 Best Community Colleges in the United States! Founded in 1890, Ellsworth Community College (ECC) is a two-year community college located in Iowa Falls, Iowa. The school is part of the Iowa Valley Community College District (IVCCD). All online classes are accredited. Enrollment at ECC averages 1000 students annually: 89% of students are Iowa residents; over 50% earn an Associate in Arts (AA) degree or Associate in Science Career Option (ASCO) degree. Ellsworth has agreements with Iowa State University, the University of Iowa and the University of Northern Iowa, along with other colleges. Credits transfer to almost any four-year college. The Dale Howard Family Activity Center was erected with ECC students and the community in mind. The wellness program includes an indoor walking/running track, state-of-the-art circuit training equipment, treadmills and fitness bikes. There is also a pool, sauna, indoor tennis court, and a variety of fitness classes. The 75,100 sq. ft. Ellsworth Equestrian Center, part of the 40-acre Robert & Arlene Hamilton campus, is a hub of activity, with year-round events. As a member of the National Junior College Athletic Association (NJCAA), ECC competes in nine intercollegiate sports. The Ellsworth football team has won two NJCAA national championships. The school offers men's football, basketball, wrestling, golf and baseball. The community college ranked #19 in the CNN Money listing of top U.S. community colleges in 2012. In April 2012, the Des Moines Register reported that, according to the Iowa College Student Aid Commission, ECC graduates have the 6th lowest average student debt load of any college in Iowa, due largely to the outstanding scholarship and financial aid packages awarded. The Washington Monthly rated Ellsworth the 17th best community college in the nation in 2007. Pearl River Community College ranks #28 on The 50 Best Community Colleges in the United States! Situated in Poplarville, Mississippi, Pearl River Community College was the first junior college established in Mississippi (1924). The college has four locations: The main campus in Poplarville, The Forrest County Center and Lowery Woodall Advanced Technology Center in Hattiesburg, and the Hancock Center in Waveland. The junior college has a strong athletics program, with its football, men's basketball, women's soccer and baseball teams winning regional and national championships on a recurring basis. Several Pearl River graduates have gone on to play football and men's basketball professionally. With an average annual enrollment of 5300, Pearl River Community College offers an associate degree and transferrable credits for those seeking a four-year degree. Career-focused and technical studies include Web Development, Truck Driving, Aerospace Electronics, and Accounting. High school students may choose dual enrollment and receive college credits. Online courses are offered for those with full-time jobs and distance learners. The college's Student Success Center offers tutoring, career advising, peer mentoring, transfer assistance and other resources. The Malone Chapel at the Poplarville campus provides fine arts and music events by the college's award-winning performing ensembles, visual art students and theatre program. Pearl River is a member of the National Collegiate Honors Council (NCHC). Its Honors Institute has an Honors Study Abroad component. The community college ranked #20 in the CNN Money listing of top community colleges in 2012. The Aspen Institute listed Pearl River Community College among the top 10% of all U.S. community colleges in 2013. Brazosport College ranks #29 on The 50 Best Community Colleges in the United States! Located about one hour south of Houston in Lake Jackson, Texas, Brazosport College occupies 156 acres in southern Brazoria County. The college has just below 6,000 students. After a serious self-examination a few years ago, Brazosport College has been on a mission to strengthen its outcomes. Since then, the college has more than doubled its retention rates, reduced achievement gaps, and improved significantly in helping students complete their degree programs, particularly minority students. Today, 68% of all awards are conferred. Brazosport College offers a rich variety of courses to address diverse educational goals. Students pursuing a bachelor's degree can enroll in courses in sixteen majors that transfer to four-year schools. Students interested in acquiring a certificate or degree in an occupational or technical field can take courses leading to a Bachelor of Applied Technology in Industrial Management in four areas and an Associate of Applied Science degree in 19 areas. Brazosport College maintains solid relationships with the local community and the region's major petrochemical employers, BASF and Dow Chemical, partnering with companies to provide technical training as needed. Examples include the Center for Business and Industry and the Small Business Development Center. The college is also committed to lifelong learning -- from its Saturday Morning Enrichment classes for K-5th graders and summer-based Kids' College and Teen College to its Adult Life and Learning Program for seniors. Pierce College ranks #30 on The 50 Best Community Colleges in the United States! Pierce College, in Puyallup, Washington, is a two-year community college serving the Pierce County college district. The college has two main colleges -- Pierce College Fort Steilacoom in Lakewood and Pierce College Puyallup in Puyallup; its extended learning sites are Fort Lewis, McChord Air Force Base, and South Hill. With just under 25,000 students enrolled in 2012, about 6500 attend the campus at Pullayup annually. One-third of Pierce students are ethnic minorities. Of the total enrolled, 50 percent plan to transfer to a 4-year college while 32 percent are enrolled in professional/ technical programs. The school offers continuing education and online classes. The junior college offers 34 associate degrees and 34 professional certificates in 61 programs of study. The most popular study areas are Pre-Nursing, Criminal Justice, Pre-Dental Hygiene and Early Childhood Education. Arts & Culture have become core activities at Pierce, including live theater, performing music, literary arts magazine, art gallery, and PierceTV. The Rainier Science and Technology Building, erected in 2010, provides classrooms, science and math labs, offices, and two winter-gardens (plant-filled glass atriums). The Arts and Allied Health Building, featuring a theater, art gallery, recording studio, nursing skills and graphic labs, has refreshed the Puyallup campus. Both the Rainier and the Arts & Allied Health buildings are eco-friendly and have earned gold certification by LEED for environmental accountability and sustainability. They have become a part of the college's curriculum and increased focus on environmental sustainability. The Pierce College Science Dome is a 58-seat domed visualization theater, the only one of its kind in the South Puget Sound region; it's used for classes and is available for pre-K-12 class visits. The college ranked #22 in the CNN Money listing of top community colleges in 2012. The Aspen Institute listed Pierce College at Puyallup among the top 10% of all U.S. community colleges in 2013. Garden City Community College ranks #31 on The 50 Best Community Colleges in the United States! Garden City Community College (GCCC), located in Garden City, Kansas, is one of 19 community colleges throughout Kansas. The junior college offers over 30 programs leading to an Associate of Arts (AA) transfer degree, an Associate of Science (AS) transfer degree, an Associate of Science in Nursing, an Associate of Applied Science (AAS) terminal degree, and the Associate of General Studies (AGS) transfer degree. Garden City Community College has a high rate of program on-time completion. For example, Manufacturing Technology students graduate at the rate of 73%; Practical Nurse students graduate at 85%. GCCC has articulation agreements with universities and colleges in Kansas. And, according to GCCC, its students consistently earn higher GPAs at their transfer schools than those who spend their entire college time at the transfer institution. GCCC's online education program, eduKan Online University, belongs to a consortium of colleges that allow for transfer of online course credits. Project Destiny is a Kansas High School Equivalency Program (HEP) for migrant/seasonal workers to earn a high school diploma or equivalent, prepare for post-secondary education, enter a chosen career or enlist in the U.S. armed forces. Garden City Community College has experienced large success in football, basketball, and baseball, producing notable alumni and professional players. The college's Business and Industry division offers a wide array of career training and enhancement courses e.g. Cyber Security for Managers, Media Buying Strategies and Sustainable Energy, Improving Email Promotions and Going Green. In partnership with the U.S. Small Business Administration and the Kansas Department of Commerce, the Kansas Small Business Development Center at Garden City Community College serves small businesses throughout Southwest Kansas. The college ranked #24 in the CNN Money listing of top community colleges in 2012. The Aspen Institute listed Garden City Community College among the top 10% of U.S. community colleges in 2011 and 2013. Independence Community College ranks #32 on The 50 Best Community Colleges in the United States! Independence Community College (ICC), situated in Independence, Kansas, is located about halfway between Joplin, Missouri, and Wichita, Kansas, to the east and west, and Kansas City, Missouri, and Tulsa, Oklahoma, to the north and south. ICC has a second campus on the west side of Independence. The community college offers 22 certificate programs in vocational occupations. Certificate programs include computer programming, administrative office management, small business management, theatre and more. Associate degrees can be earned in the arts, sciences, and applied sciences. Examples of the 46 programs of study include athletic training, accounting, early childhood education, various specialties in engineering technology, liberal studies, management, theater, and, through a partnership with Neosho County Community College, nursing. The second campus, ICC West, houses allied health, EMS, cosmetology, GED/ABE, and veterinary technology. The state-of-the-art facility includes a classroom, lab, animal wards, prep room, small animal treatment, surgery, food prep, grooming, pharmacy, and radiology. The school sponsors TRIO and Upward Bound, a college preparatory program assisting 60 participants from 8 target schools in Chautauqua, Labette, Montgomery, and Wilson Counties to succeed in their studies. The William Inge Center for the Arts offers a chance for ICC students to work directly with professionals in theatre. Named after famous playwright and alumni, William Inge, the center presents an annual Inge Festival: a four-day festival in which students and community residents attend workshops and plays and tour historical sites that were part of Inge's childhood. ICC has athletic programs on campus including football, volleyball, men's/women's soccer, men's/women's basketball, women's softball, baseball, and golf. ICC's chapter of Phi Theta Kappa, the honor society for junior colleges, ranked in the top 100 out of 1,100 active chapters. Independence Community College ranked #21 in the CNN Money listing of top community colleges in 2012. Coconino Community College ranks #33 on The 50 Best Community Colleges in the United States! Coconino Community College (CCC) serves northern Arizona. The main campus is in Flagstaff, Arizona; other college locations include Grand Canyon, Tuba City, Page/Lake Powell, Fredonia, Williams and Flagstaff Lone Tree. The college serves over 10,000 students annually and offers more than 70 associate degrees and certificates. CCC offers courses in Arts & Science, Career & Technical, and Corporate & Community Learning. The junior college provides Associate of Arts (AA), Associate of Fine Arts (AFA), Associate of Science (AS) and Associate of Applied Science (AAS) degrees in an array of study areas including Anthropology, Environmental Studies, Dance, Visual Arts, etc. The college's S.T.A.R.T. and TRIO programs provide many resources to help CCC students succeed academically. CCC's Community Learning program, specializing in corporate development and professional courses, offers a six-module Leadership Academy. The school's Life Long Learning program includes courses such as Beginning Japanese, Bouldering, Fly Tying and Beginning Flamenco. Instruction is available through on-campus, online and interactive TV (ITV) courses. CCC's Small Business Development Center, a partnership with the U.S. Small Business Administration, offers a series of monthly workshops on business basics and offer specialized workshops throughout the year. Under the distinguished CCC2NAU program, Coconino Community College partners with Northern Arizona University and 16 other colleges to manage transfer needs to a four-year college. The CC2NAU program earned several awards including a 2012 Lee Noel and Randi Levitz Retention Excellence Award, a 2012 Outstanding Institutional Advancement Advising Program Award from the National Academic Advising Association, and the Arizona College Access Network's 2011 Pathways to Postsecondary Education Award. Coconino Community College ranked #25 in the CNN Money listing of top community colleges in 2012. Southeast Kentucky Community & Technical College ranks #34 on The 50 Best Community Colleges in the United States! Southeast Kentucky C&T College (SKCTC), located in Cumberland, Kentucky, is one of 16 two-year colleges in the Kentucky Community and Technical College System (KCTCS). The college serves Bell, Harlan and Letcher counties in Kentucky, and boundary counties in Tennessee and Virginia. Southeast Kentucky C&T College offers Associate of Arts (AA), Associate of Science (AS) and Associate of Applied Science (AAS) degrees and an extensive list of diploma and certificate programs. Unique programs of study include Surgical Technology, Professional Craft: Pottery, Computer Aided Drafting & Design, Funeral Service and Radiography. More than 50 percent of the student body is enrolled in transfer programs. Under Kentucky law, students who complete an Associate of Arts (AA) or Associate of Science (AS) degree can have their course work accepted at any state, public four-year school. Through a partnership with the “Kentucky Virtual Campus,” SKTCT students can take more than 1,100 classes online. Additionally, the college sponsors the Upward Bound Math Science program to prepare low-income and first-generation college bound students for success in higher education. “Project Lead The Way” is a middle school and high school project to prepare students for success in engineering and engineering technology programs. SKCTC also offers workforce courses in a variety of fields including: Commercial Driver's License (CDL), Kentucky Safety Training Institute, Kentucky Coal Academy, Drinking Water Treatment, and Mining Career and Technical Training. The Pine Mountain Community Development Corporation (PMCDC) is a multi-bank community development corporation that provides start-up or expansion capital to microenterprises and small businesses in the SKTCT region. The Small Business Development Center provides new and existing businesses with counseling, training and other resources. The Southeast Kentucky C&T College is a member of the National Collegiate Honors Council (NCHC). The community college was named a 2013 Finalist in the Aspen Institute's Prize for Community College Excellence. Moorpark College ranks #35 on The 50 Best Community Colleges in the United States! Moorpark College is a community college located in Moorpark, in Ventura County, California. Moorpark, along with Oxnard College and Ventura College, form the Ventura College Community College District. With an annual enrollment of just under 14,000 students, 33% carry 12 or more units. Minorities make up over 18% of the students; 150 foreign students from 52 different countries attend Moorpark College. The college offers 1,500 classes per semester in 70 disciplines, including a broad variety of transfer majors for a bachelor's degree and programs that lead to associate degrees and certificates of achievement. Moorpark College offers occupational majors geared to local and national employment needs and trends. Also, the college has one of the country's most successful community college speech teams. Based on enrollment, Moorpark College ranks second in the state for transfer to the University of California and California State University systems. Moorpark has established over 1,325 articulation-by-major agreements with University of California, California State University, and private/independent colleges and universities. Moorpark College is home to some distinctive learning amenities: The Exotic Animal Training and Management (EATM) Program has an on-site teaching zoo open to the public; the Charles Temple Observatory, the only public observatory in Ventura County, hosts astronomy classes and public programs; the Child Development Center serves as a practicum/observation site for the Child Development Program; and the Performing Arts Center is a state-of-the-art facility where students can present musical, comedy, speech, and theatrical productions. Moorpark College partnered with nearby Oxnard College in establishing the Camarillo Center, located on California State University, Channel Islands' campus. The center, an 8,000 square foot bio-manufacturing facility, houses the Instructional Biotechnology Program. The High School at Moorpark College awards dual college and high school credit to local junior and senior high students and the college participates in the Foster Youth Success Initiative to support foster youth in their educational pursuits. Moorpark's “Desire2Learn” program offers online courses to students. Each summer, the college presents a Jr. Safari Summer Camp for kids aged 7-13. The college ranked #26 in the CNN Money listing of top community colleges in 2012. Clarendon College ranks #36 on The 50 Best Community Colleges in the United States! Located in Clarendon, Texas – the county seat of Donley in the Texas Panhandle – Clarendon College (CC) is a small community college serving the counties of Armstrong, Briscoe, Childress, Collingsworth, Donley, Gray, Hall, and Wheeler. The college operates branch campuses in Pampa and Childress. The college is more than 200 years old and is one of 50 community colleges in Texas. The school also offers online learning. Clarendon College has an annual enrollment of 1500 students. Although most of CC's students come from the local region, the college has an impressive diversity of students, including international students, despite its small size. Clarendon College confers certificates and 2-year degrees. The curriculum for the Associate in Arts (AA) and the Associate in Science (AS) degrees are designed for the student planning to transfer to a senior college or university. The Associate in Applied Science (AAS) degree is awarded for successful completion of a two-year workforce education program with prescribed occupational competencies. The Certificate of Technology and the Certificate of Completion are awarded for successful completion of competencies and curriculum in a workforce education program of less than two years in length. The college has 27 programs of study across three academic divisions: Liberal Arts, Science & Health, and Workforce. Clarendon has a solid athletics program. Intercollegiate teams at CC include baseball, softball, men's/women's basketball, men's basketball, volleyball, cross country, golf, cheerleading, rodeo, meats judging, livestock judging, and ranch horse team. Clarendon's campus life is active with many students clubs and organizations e.g. Drama Club, Multicultural Club, College Choir, Block and Bridle, Rodeo Team, White Caps. The school offers a summer enrichment program, “Kids College,” for boys & girls 5-15. The college ranked #28 in the CNN Money listing of top community colleges in 2012. College of the Ouachitas ranks #37 on The 50 Best Community Colleges in the United States! College of the Ouachitas, situated in Malvern, Arkansas, is a full two-year college in south-central Arkansas. The school also manages the Ouachita Area Career Center (OACC), the Ouachita Area Adult Education Center (OAAEC), and the Workforce Center. College of the Ouachitas has a general enrollment of 1400 annually. The school especially serves low-income students: 61% of first-time undergraduate students at the college receive Pell grants. In recent years, College of the Ouachitas has shown continual increases in degrees awarded. For every 100 full-time equivalent students, 46 students at College of the Quachitas complete their degrees. Additionally, compared to the national average of 40%, 47% of first-time full-time students at College of the Ouachitas graduate or transfer within three years. The college features a broad curriculum. College of the Ouachitas offers certification in a variety of academic, law enforcement, medical, and technical fields. Beyond its GED preparation courses, the school's Adult Education program offers the WAGE™ Program through which potential employees can earn state recognized certificates: Employability, Industrial, Clerical, Bank Teller and Customer Support I and II. The school's Continuing Education program provides online courses and, in collaboration with the Division of Child Care and Early Childhood Education of the Arkansas Department of Health and Human Services, the Child Care Orientation Training (CCOT). The CCOT course is the first step towards obtaining a Child Development Associate (CDA) certificate. College of the Ouachitas is a member of the National Collegiate Honors Council (NCHC). The college was named a 2013 Finalist in the Aspen Institute's Prize for Community College Excellence. Foothill College ranks #38 on The 50 Best Community Colleges in the United States! Foothill College, located in Los Altos Hills, California, is part of the Foothill-De Anza Community College District. The campus has garnered praise and awards for its beautiful Japanese-inspired campus and unique architectural design. The school's facilities –the Krause Center for Innovation, Japanese Cultural Center, Observatory, Bamboo Garden & Azumaya Meditation Pavilion, Robert C. Smithwick Theater and Dental Health Clinic – are well utilized by the local community. The college offers 79 Associate degree programs and 107 certificate programs throughout 6 divisions of study: Biological & Health Sciences, Business & Social Sciences, Fine Arts & Communication, Language Arts, Physical Sciences, Mathematics & Engineering. Foothill was the first community college in California to offer online courses. The school offers 500+ online courses. The Krause Center for Innovation features professional development education and training for teachers, serving K-12 educators through three programs: Making Education Relevant and Interactive through Technology (MERIT), the Faculty Academy for Mathematics Excellence (FAME), and FASTTech courses designed and developed to address the technology training needs of elementary, middle, secondary and community college educators. The average student enrollment is 18,000, with a rich cultural diversity. According to Community College Week in 2001, Foothill had the 12th highest population of international students of all community colleges in the U. S. and its English as a Second Language (ESL) program allows foreign students to earn a two-degree and prepare for a four-year college. Foothill College's 62% transfer rate is the best in the state of California. The college ranked #29 in the CNN Money listing of top community colleges in 2012. Northeast Iowa Community College ranks #39 on The 50 Best Community Colleges in the United States! Northeast Iowa Community College (NICC) serves all or parts of thirteen Iowa counties. NICC has two main campuses – Calmar and Peosta (close to Dubuque) – and a satellite campus in downtown Dubuque. Northeast Iowa Community College awards the Associate in Arts (AA), Associate in Science (AS), and Associate in Applied Science (AAS) degrees. The community college also provides transfer programs for those seeking to continue their education at four-year institutions. Northeast Iowa Community College has an articulation agreement with the University of Dubuque to provide a transfer option and has similar agreements with other four-year schools to guarantee students will be able to transfer their credits. Northeast Iowa Community College's distance learning courses include online courses, courses in a two-way, interactive fiber optic network called Iowa Communications Network (ICN), and hybrid options. NICC's Business and Community Solutions offers an array of non-credit courses for individuals and customized on-site training for local businesses. The Peosta Campus is home to the National Education Center for Agricultural Safety (NECAS), an accredited agricultural training center. The college named a 2011 Finalist with Distinction in the Aspen Institute's Prize for Community College Excellence. The college ranked #63 in the CNN Money listing of top community colleges in 2012. Chippewa Valley Technical College ranks #40 on The 50 Best Community Colleges in the United States! Chippewa Valley Technical College (CVTC) is part of the part of the Wisconsin Technical College System; its largest campus is located in Eau Claire, Wisconsin. CCTC also has campuses in Menomonie, Chippewa Falls, Neillsville and River Falls. The college provides support to the workforce needs of the region. Chippewa Valley Technical College provides associate degree, technical diploma, certificate and adult continuing education programs. The college offers traditional classes as well as online classes and blended and hybrid formats. Chippewa Valley Technical College has small class sizes. The college's Business & Industry Services provides a wide range of professional development seminars and continuing education training. Chippewa Valley Technical College provides a variety of student clubs. CVTC is #1 in Career and Technical Education Teacher Award recipients for Wisconsin technical colleges. Chippewa Valley Technical College ranked #10 in the Washington Monthly 2010 ranking of America's 50 best community colleges list and named a 2013 Finalist in the Aspen Institute's Prize for Community College Excellence. 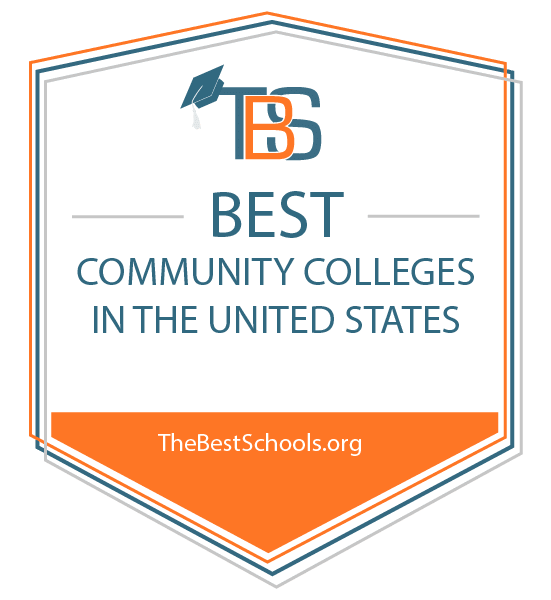 Kaskaskia College ranks #41 on The 50 Best Community Colleges in the United States! Situated in Centralia, Illinois, Kaskaskia College is one of the oldest community college in Illinois. Kaskaskia College has an average annual enrollment of 12,000 students. The college offers 41 associate degree career programs and 93 certificate programs. Kaskaskia students earn Associate of Science and Associate of Arts degrees for transfer to four-year colleges and universities. Kaskaskia College participates in the Illinois Articulation Initiative (IAI), a statewide agreement that provides transfer of completed courses in the Transfer Core Curriculum between participating colleges. To assist students in successful completion of their courses, Kaskaskia's Student Success Center offers tutoring, academic workshops, testing and learning assessments and career resources. In partnerships with regional businesses, Kaskaskia College works to ensure a skilled and motivated workforce throughout the district. Annually, the college serves some 2,500 business/industry employees with educational programs and 4,000 others through its Career Center and its Continuing and Community Education programs. Kaskaskia College houses and directs the Illinois Small Business Development Center (ISBDC) and the International Trade Center (ITC). Kaskaskia College's athletic programs include men's/women's basketball, men's/women's golf, women's softball, volleyball, cheerleading, dance team, cross country, men's/women's soccer, men's baseball, and men's/women's tennis. In 2013, The KC golf team finished 4th overall in the Region XXIV Tournament. Kaskaskia College ranked #37 in the CNN Money listing of community colleges in 2012. Southwest Texas Junior College ranks #42 on The 50 Best Community Colleges in the United States! Southwest Texas Junior College (SWTJC) is a two-year college serving 11 counties in southwest Texas, an area stretching from the Texas Hill Country to the US-Mexican border. SWTJC has six campuses: Uvalde, Del Rio, Eagle Pass, Hondo, Pearsall and Crystal City. Student enrollment runs 6,000 annually, with 4,000 of those full-time students. 24% of SWTJC's students receive their courses via online, interactive video and the Virtual College of Texas. Online and videoconferencing instruction are offered at all of SWTCC's campuses. The junior college awards Associate (AA), Associate of Science (AS), Associate of Applied Science (AAS) degrees and several levels of certificates. Numerous articulation agreements between two- and four-year institutions facilitate the transfer process. 2 + 2 Plans and Transfer Guides are available for most of the major Texas colleges and universities. SWTCC's Local Articulation program is a partnership between area high schools, local businesses and SWTJC. By offering six different study programs, high school students can earn free college credit towards an Associate of Applied Science (AAS) degree at SWTJC. The school's academic programs include Business, Criminal Justice, General Studies, Computer Science, Engineering, and Teaching. Technical programs include Automotive Technology, Radiologic Technology, Vocational Nursing, Management and Wildlife Management. Workforce Training programs include Emergency Medical Technician, K-9 Handler, Lineman Training, Nurse Aide, and Real Estate. The college is a member of the South Texas Club Sports League (STCSL), which consists of teams from Alamo Colleges and from two-year colleges not associated with any other athletic leagues. SWTCC competes in women's volleyball and men's/women's basketball. Annually, the college presents its SWTJC Creative Arts Contest. Winners in ten age divisions and ten literary and visual art categories receive modest cash prizes at the school's annual awards ceremony. The college named a 2011 Finalist in the Aspen Institute's Prize for Community College Excellence. Mott Community College ranks #43 on The 50 Best Community Colleges in the United States! Situation in Flint, Michigan, Mott Community College is a community college serving Genesee, Lapeer, and northwest Oakland counties. The college is named after Charles Stewart Mott and includes five learning centers. Offering its curriculum to 10,500 students annually, with 6500 part-time and 4000 full-time, Mott Community College has 26% minorities represented and 82% from within the college district. Mott Community College has eight academic divisions, featuring 61 associate degrees and 40 pre-associate certificates. The most popular courses are within the Humanities division including courses such as Radio and Television & Film, Sign Language Interpreter Education and Composition for Technical Fields. The Mott Community College Men's Basketball team won the 2003, 2007, 2008 and 2012 national NJCAA Men's Division II Basketball Championship games. They were the division runner-ups in 2001, 2004, and 2011. The Visual Arts & Design Center provides education in the fine arts and graphic design. MCC is a member of the National Collegiate Honors Council (NCHC). Mott Community College named a 2011 Finalist in the Aspen Institute's Prize for Community College Excellence and listed among the Top 100 Associate Degree Producers in 2011 by Community College Week. In 2010, the Association of Community College Trustees (ACCT) named MCC's president, Dr. M. Richard Shaink, as this year's best community college president in North America (covering American states and territories as well as Canadian provinces and territories). Linn State Technical College ranks #44 on The 50 Best Community Colleges in the United States! Enrollment at Linn State averages 1,100 each year. The majority of LSTC students are from Missouri. Since 1995, 95% of LSTC graduates are gainfully employed or continue their education within six months of graduation. One characteristic of Linn State Technical College courses is the required General Education coursework to establish a solid foundation in math, oral and written English, science and computing skills. Another characteristic is the integration of academic and technical education into a balanced program to create highly skilled and broadly knowledgeable technicians. Students can obtain certificates for one year, less-than-one-year and one semester in the General Education Core. Linn State's Business and Industry Department provides customized training to companies throughout Missouri, helping employers build a skilled workforce. The Continuing Technical Education program is directed towards construction contractors and governmental employees e.g. Blueprint Reading, Construction Math Refresher, and Asphalt Mixed Design. Linn State ranked #39 in the CNN Money listing of community colleges in 2012. Mississippi Gulf Coast Community College ranks #45 on The 50 Best Community Colleges in the United States! The main campus of Mississippi Gulf Coast Community College (MGCCC) is located in Perkinston, Mississippi; other campuses and learning centers include the Jackson County Campus (in Gautier), the Jefferson Davis Campus (in Gulfport), the Community Campus, a non-traditional campus without walls, the George County Center (in Lucedale), the West Harrison County Center (in Long Beach), the Applied Technology and Development Center (in Gulfport), and the Keesler Center (at Keesler Air Force Base in Biloxi). Mississippi Gulf Coast Community College offers more than 50 Career/ Technical programs including Electrical Lineman Apprentice, Food Production & Management Technology and Machine Tool Technology. In addition to some out-of-state institutions, MGCCC participates in the articulation agreement between Mississippi Institutions of Higher Learning and the Mississippi State Board for Community & Junior Colleges. Online courses are offered via the Mississippi Virtual Community College (MSVCC) consortium, comprised of 15 community colleges throughout Mississippi. MGCCC's Volunteer and Service Learning Center (VSLC) of Mississippi Gulf Coast Community College provides student education and career-relevant experience through community service and civic responsibility. The Mississippi Gulf Coast Advanced Manufacturing and Technology Center was established in partnership with MGCCC, Mississippi Power and the Harrison County Development Commission. The center serves as a training facility to support economic development activities on the Mississippi Gulf Coast. Mississippi Gulf Coast Community College has a solid athletics program and competes in intercollegiate sports in football, basketball, baseball, soccer, softball, golf and tennis. Mississippi Gulf Coast Community College listed among the Top 100 Associate Degree Producers 2011 by Community College Week. The college named a 2011 Finalist in the Aspen Institute's Prize for Community College Excellence. Washington County Community College ranks #46 on The 50 Best Community Colleges in the United States! Washington County Community College (WCCC) is located in Calais, Washington County, Maine, overlooking the St. Croix River; it's in a rural area on the border between the United and Canada. WCCC is one of seven colleges in the Maine Community College System. Washington County Community College has a general enrollment of 500 students. WCCC is a residential college with 24 study programs – from Adventure Creation and Tourism to Geographic Information Systems, from Building Construction Technology to Human Services. The college provides Associate of Arts (A.A.) degrees, Associate of Science (A.S.) degrees, Associate of Applied Science (A.A.S.) degrees as well as diplomas and certificates. Washington County Community College also offers courses in business/job training, personal enrichment, community service, for high school students and online learning. Associate's degree credits may be transferred to a four-year university and count towards completion of the first two years of their bachelor's degree. MaineStreet is a listing of transferrable courses that fall within the articulation agreements with colleges within the Maine College System. Washington County Community College ranked #11 in the 2010 Washington Monthly ranking of the top 100 U. S. community colleges. College Atlas.org named WCCC one of the top 25 community colleges in 2012. The Aspen Institute listed Washington County Community College among the top 10% of community colleges in 2011 and 2013. Northland Community & Technical College ranks #47 on The 50 Best Community Colleges in the United States! Northland Community & Technical College, established in 1949, has four campuses: East Grand Forks Campus, Thief River Falls Campus, Aerospace Campus and Roseau Satellite Campus. The school is part of the Minnesota State Colleges and Universities system. The school offers a liberal arts program for students interested in obtaining a bachelor's degree at a four-year school. Northland Community & Technical College also provides a wide array of technical programs. The college provides over 100 career programs and degree options. Northland Community & Technical College offers online programs in the areas of Business and Entrepreneurship; Health and Human Services; Law, Public Safety and Security; Liberal Arts/Sciences; and Science and Technology. Northland Community and Technical College provides Associate in Applied Science degrees, Associate in Science degrees, Associate in Art degrees as well as diplomas and certificates. The school also provides a wide array of customized training to help prepare students for their selected career field. Northland Community & Technical College's largest programs include practical nursing; liberal arts; sales, marketing and management; aviation maintenance technology; associate degree mobility nursing; criminal justice and law enforcement. Northland Community & Technical College provides a wide array of clubs, activities and cultural events. The Aspen Institute listed Northland Community & Technical College among the top 10% of all U.S. community colleges in 2013. Coastal Carolina Community College ranks #48 on The 50 Best Community Colleges in the United States! Coastal Carolina Community College, a two-year institution, is located in Jacksonville, North Carolina. Coastal Carolina Community College is one of the 58 public community colleges in North Carolina and serves Onslow County, which hosts two of the most strategic bases of the US Marine Corps. Coastal students consistently meet or exceed all of the annual performance measures in the North Carolina Community College System more often than any other college. Coastal Carolina Community College offers associate degrees in the arts (A.A.), science (A.S.), and fine arts (A.F.A.) for students seeking to transfer to a four-year college or university. AFA programs of study include Drama, Music and Music Education, and Art. A.S. programs include Biology Education, Biology and Engineering. Examples of A.A. programs are Art Education; Economics, Finance and Marketing; Communication/Communication Studies; Elementary Education; English Education; Geography; Information Systems; Middle Grades Education; Physical Education; Political Science; Social Science Secondary Education; and Sociology. Coastal Carolina Community College's 64/65 credits of coursework are designed to parallel freshman and sophomore years at four-year colleges and universities. Coastal and University of North Carolina Wilmington (UNCW) have an articulation agreement guaranteeing Coastal Carolina Community College's two-year degree graduates who maintain at least a “B” average begin as juniors at UNCW. Additionally, Coastal, UNCW, Onslow County Schools, and Marine Corps Base Camp LeJeune have developed a partnership to offer “2+2” teacher training for elementary education. Forty to fifty percent of Coastal Carolina Community College students are active duty military and their family members. The college offers eight-week semester courses on Marine Corps Base Camp Lejeune and on Marine Corps Air Station New River to accommodate the military work schedule. The school's Division of Continuing Education serves more military personnel than any of the other fifty-seven community colleges in the state. The school's Customized Training Program provides education and training opportunities for local businesses and industries. Coastal Carolina Community College's Continuing Education Program focuses on licensure & certification courses for a wide variety of professional and technical careers. Normandale Community College ranks #49 on The 50 Best Community Colleges in the United States! Normandale Community College, located in Bloomington, Minnesota, serves the communities of the southwestern portion of the Minneapolis–Saint Paul region and it's a member of the Minnesota State Colleges and Universities (MnSCU) system. Normandale Community College has an annual enrollment of 10,000 students and the student population is very diverse – 30% and growing. Some of the programs of study offered include dental hygiene, nursing, hospitality management, dietetics, and engineering foundations. Normandale confers various certificates for 9-30 credits as well as multiple two-year degrees: Associate of Arts (AA), Associate in Fine Arts (AFA), Associate in Science (AS), and Associate in Applied Science (AAS). Examples of degree programs of study include Dental Hygiene, Hospitality, Creative Writing, Special Education, Theatre, Anthropology and World Languages. In collaboration with Education for Global Learning (EGL), Normandale Community College also has a short-term and semester Study Abroad program. The Minnesota Transfer Curriculum (MNTC) is a series of 40 course credits transferable to all secondary education institutions in Minnesota. Further, Minnesota Transfer has established articulation agreements with many non-Minnesota colleges and institutions. The campus features a two-acre Japanese Garden, the Academic Partnership Center and the Fine Arts building. Annually, the college presents various student recitals, band and choral concerts, art exhibits and other public events. Normandale's Continuing Education program offers a full set of courses for professional enrichment e.g. New World of Work, Microsoft Office 2010 and personal learning, Foreign Languages, Feng Shui & Sound Therapy. Additionally, Normandale offers organizational training e.g. Agile, ScrumMaster, and Six Sigma training and it also develops specialized courses customized for local business and presented at the college, at the business location or online. Normandale ranked #48 in the CNN Money listing of community colleges in 2012. Schoolcraft College ranks #50 on The 50 Best Community Colleges in the United States! Schoolcraft College, located in Livonia, Michigan, has a satellite campus in Garden City, Michigan. Schoolcraft College celebrated its 50th anniversary in 2011. Enrollment annually averages 30,000 students. The college awards certificates, associate degrees and post-associate certificates. Examples of degree-oriented academic programs include Liberal Arts, Health, Fine Arts, Anthropology and Education. Examples of certificate programs include Fire Technology, Baking & Pastry Arts, Computer Graphics- 3D Animation, and Sound Recording Technology. Schoolcraft College, well known for its culinary arts program, is headed by four certified master chefs. It has the highest chef/student ratio of any culinary program in the U.S. The college operates three dining venues as part of its culinary arts program. The Transition Center supports students and is home to the Women's Resource Center, Adult Student Services, Family Resources and Student Engagement Programs. The Biomedical Technology Center focuses on science, technology, engineering and mathematics (STEM) and genetics, robotics, information systems and nanotechnology (GRIN). The 11,000 sq. ft. Schoolcraft Fitness Center, with its state-of-the-art strength, cardio, free weight and stretch equipment is free to credit students and available for membership for non-credit students, faculty, community members and alumni. The college's Public Safety Training Complex, opened in 2010, houses its public safety programs such as Criminal Justice, Fire Technology, Correctional Science, Homeland Security, Police/Fire/Academies and Public Safety in-Service. Schoolcraft College has a strong student activity presence. The MacGuffin, is a national literary magazine published from Schoolcraft College and The Schoolcraft Connection, the school's award winning student newspaper continues to garner journalistic praise. In 2009, the Women's Basketball team won their second NJCAA Region 12 District H Title. To serve local families, the school's “Kids on Campus” program offers classes for children over the weekends during the fall, winter, and spring semesters. To serve local businesses and industry, the college's Business Development Center includes the Michigan Small Business and Technology Development Center (MI-SBTDC), the Procurement Technical Assistance Center (PTAC), and Workforce Training Solutions. The college is a member of the National Collegiate Honors Council (NCHC). Schoolcraft College ranked #49 in the CNN Money listing of community colleges in 2012. Based on their proven levels of excellence, all of these community colleges have earned the privilege of your consideration. 1. Does the community college have an honors program? What are the academic requirements? Would you qualify? Getting accepted into the honors programs at a community college will afford you additional opportunities and increase your chances for successful graduation and transfer. 2. Do you plan to transfer to a four-year college or university? If so, call a few of the places you hope to attend and find out how they perceive the community colleges on your list and which colleges accept the most transfers from those community colleges. Ask about any guaranteed transfers and “articulation agreements” that may be in place. 3. Inquire about the specific academic program you are interested in and compare the completion rates of that program to the overall rates of the college. If there is a notable gap between the two rates, ask why. 4. For optimal learning, do you prefer a small campus with special counseling/coaching or a larger campus with an expansive array of course options and educational opportunities? If needed, ask about remedial courses and other support resources. Compare the colleges on your short list to your personal needs. 5. Research and compare the stats on the schools you are most interested in: the college's graduation rate, transfer rate, “success” rankings based on various surveys.